Europeans Summon Israeli Diplomats On Settlement Plan : The Two-Way Israel's ambassadors to Britain, France, Denmark, Spain and Sweden were summoned to hear criticism of the plan. The criticism in the U.S. was more muted. 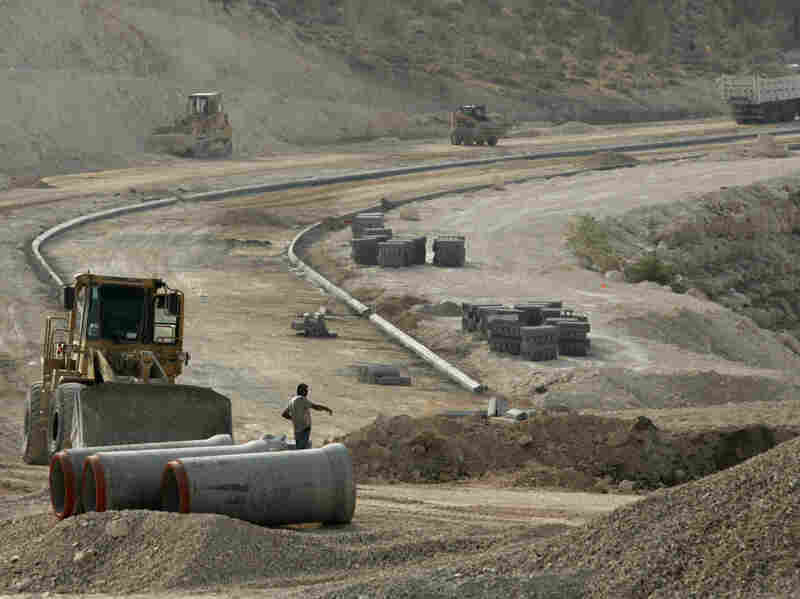 Construction workers are seen at the E1 construction site near the West Bank settlement of Maaleh Adumim on the eastern outskirts of Jerusalem in 2007. It calls for Israel to build 3,000 housing units in East Jerusalem and the West Bank. While the international community opposes all Israeli settlement building, construction near Jerusalem is particularly sensitive because the Palestinians seek the eastern part of the city for a future capital, and say this plan would greatly undermine efforts for a two-state solution. In addition, the Israeli plan was announced last Friday, just a day after the U.N. General Assembly voted to upgrade Palestinians to a "nonmember observer state" from "nonmember observer entity." Israel also announced Sunday that it would withhold $100 million in tax revenue from the Palestinian Authority — and use the money to repay what the Palestinians owe to Israel's electric company for power supplied to areas in the West Bank. Israel's latest project, in the area known as E1, has been a hotly contested issue for years. Palestinians say it would form a barrier between Palestinians living in East Jerusalem and those in the rest of the West Bank. This would make it extremely difficult, if not impossible, for the Palestinians to have a viable, contiguous territory in the West Bank. "This morning I met Israeli Ambassador to the UK, Daniel Taub, who was formally summoned to the Foreign Office. Mr. Taub was summoned following the Israeli decisions to build 3,000 new housing units in East Jerusalem and the West Bank, to unfreeze planning in the area known as E1 and to withhold tax revenue from the Palestinian Authority. I set out the depth of the U.K.'s concern about these decisions and I called on the Israeli government to reverse them. The settlements plan in particular has the potential to alter the situation on the ground on a scale that threatens the viability of a two-state solution." Similar statements were issued by the foreign ministries of the other European nations. Germany, which rarely criticizes Israel, also expressed opposition to the plan. Israel's Haaretz newspaper, citing unnamed senior European journalists, said Britain and France were considering recalling their envoys to Israel. "According to three senior diplomats from various EU countries, Britain and France were coordinating their moves against Israel, which they will reportedly implement over the next few days, and have discussed the extraordinary step of recalling their ambassadors from Tel Aviv for consultations. This step has never been taken before by these countries toward Israel. It would be so extreme that Britain and France may not take such action at this point but, rather, could invoke it in the case of further escalation of Israeli actions against the Palestinians. A final decision in the matter will be made today by the British and the French foreign ministers." Among the less-severe steps the two countries are considering, according to Haaretz, is suspending strategic dialogue with Israel and backing EU sanctions against the settlements. An unnamed Israeli official told The New York Times that Israel's moves may have been a direct result of the vote on the Palestinian upgrade at the U.N. The vote last week was 138-9 with 41 abstentions. The U.S. and Israel voted against the resolution, but others, including those that are friendly to Israel, like Germany, abstained, as did Britain. France, Spain, Sweden and Denmark voted for the resolution. "It is well known that Europe and Israel have a different approach on settlements," the Israeli official told The Times. "There is nothing new here. If European countries would have behaved differently in their vote at the United Nations last week," he continued, "we may have reacted differently." But in the U.S., where close relations with Israel enjoy bipartisan support, the criticism has been more muted. "We urge Israeli leaders to reconsider these unilateral decisions and exercise restraint as these actions are counterproductive and make it harder to resume direct negotiations," White House spokesman Jay Carney said. Israel says it will stand by its decision.